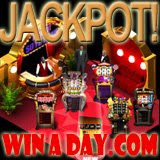 The progressive jackpot at 3D online casino WinADay.com has just gone over $120,000 (€97K). It’s only a month since an Italian player hit the WinADay.com jackpot for $120K but if the new three-dimensional casino is anything like its sister casino, Slotland.com, that makes it well due for another hit. WinADay.com’s 3D lobby and animated casino staff create a unique online casino experience. Greeted at the door by the animated casino staff, they are ushered into the main casino lobby. Casino service staff like Pete the Pit Boss, Barry the Bartender, Bill the Banker, Amanda the Administrative Assistant and Sam the Security Man help players enjoy the six absolutely unique slots and video poker games waiting for them there. Last month, an Italian player known as Monica68 won €116,200 ($148,724) while playing Wheeler Dealer, one of the five unique slot machines at the three dimensional casino site. This was the first progressive jackpot win at the new site. It was reset to $30,000 and has been increasing steadily ever since. Since launching last year, WinADay.com has added three more unique slot machines and now offers six one-of-a-kind games. While WinADay.com game designers let their imaginations go wild on the first four games, the back-to-basics approach to the latest game, Slot-O-Matic, is proving very popular with players. The most recently added game, Slot-O-Matic, is an easy one payline, three-button slot machine while the recently launched Heavenly Reels is a four pay line slot adorned with heavenly cherubs and with angel wings that appeals to strategic slots players since. Gold Boom is a 9-wheel, 6-pay line slot machine that offers free bonus spins and awesome payouts.